A supporter of a local politician in the southern Philippines was shot dead on Monday, becoming the first person to be killed in poll-related violence on the day of national elections, police said. The man, a cousin of the vice governor in North Cotabato province, was gunned down while riding on a motorcycle before polls opened on Monday morning, regional police said in a statement. He and another man on the motorbike were ambushed in Kidapawan town, according to the statement. The other man was wounded but his injuries were not life threatening. Police said they suspected the gunmen were supporters of a rival candidate. About 40 million Filipinos were expected to go to the polls on Monday to elect more than 17,000 positions from the president down to town councilor. Violence always plagues elections in the Philippines, with local politicians often using gunmen to eliminate rivals' challenges or intimidate voters. Philippine soldiers wait for their turn to vote at a military camp in Fort Bonifacio, southern Manila. Monday's killing brings to at least 30 the number of people killed in political violence over the past four months, according to police statistics. This does not include 57 people massacred in the southern Maguindanao province in November last year, allegedly by a powerful Muslim clan to stop a rival from running for provincial governor. Thousands of troops were in place on Monday in Maguindanao, but there were still outbursts of violence. 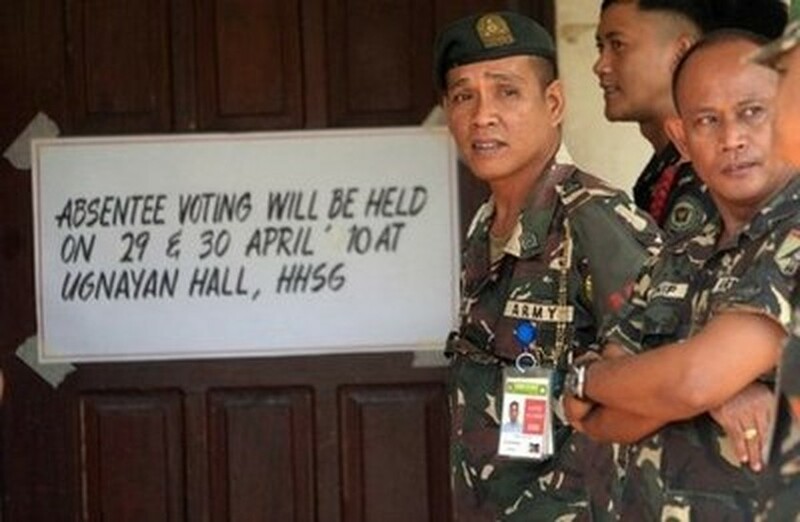 Suspected armed followers of a local warlord fired mortar shells at election officials and their military escorts before dawn Monday, provincial police chief superintendent Alex Lineses said. The military fired back with their own mortars that sent the armed men fleeing, said Lineses. There were no reports of casualties.